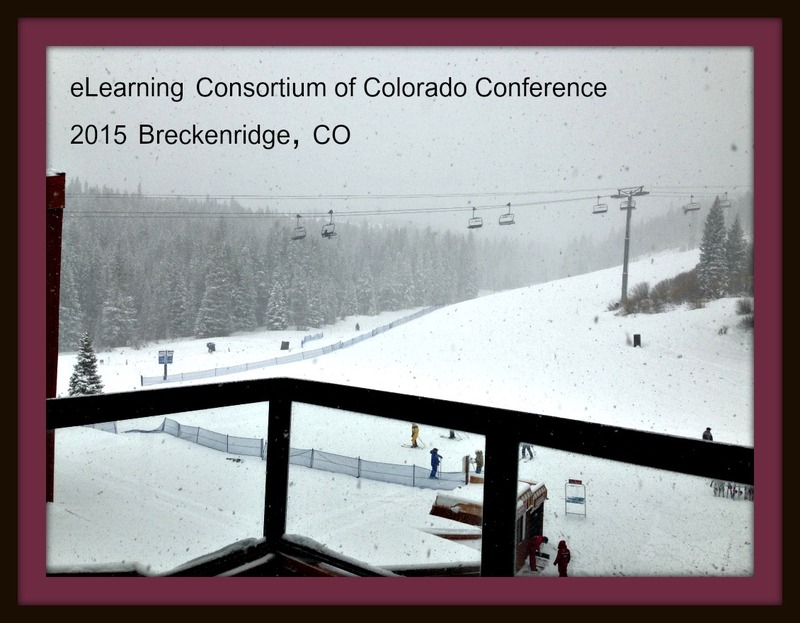 I had the honor of presenting at last week’s eLearning Consortium of Colorado‘s (eLCC) annual conference in Breckenridge, Colorado. Several attendees stayed an extra night due to the typical eLCC conference weather and I was relieved to make it home on time. Robbie Melton was one of the keynote speakers and she was very entertaining and brought a ton of cool gadgets to share during her presentation. I hosted a roundtable about using social media in education which I’ve posted below along with Sherri Jones’ slideshare presentation on gamification and gamified learning. Enjoy! Here is Sherry’s presentation which I missed because it was difficult to choose among all of the wonderful presentations. And I knew I could count on Sherry to post it online. Unfortunately the conference hashtag (#eLCC2015) was overtaken by an European Lung Cancer Conference so we didn’t do much tweeting during the conference. I’m encouraging people to use #eLearningCO instead but it is a little late. We would have had more robust backchannel conversations and sharing if we would have promoted the new hashtag sooner – oh well. Kudos to the eLCC conference committee for another excellent conference! SEI is a program led by the ELI teaching and learning community to find current effective practices that enable the collection of evidence to help faculty and administration make decisions about adopting and investing in best practices. They developed this Study Guide & Template so we could all use it as we “seek evidence of impact” at our institutions. All three presenters were excellent and I’ve posted some of the resources shared from the webinar and back channels. I definitely recommend checking them out and getting involved with this important research. Slides and eventually the recording which ELI and QM members will have access to for the next 90 days.